The Historical Sociolinguistics Network (HiSoN), as sponsored by the Research Foundation Flanders (FWO) as part of its Historical Sociolinguistics Research and Training Program, is proud to announce the first edition of the Historical Sociolinguistics Young Researchers Forum (HSYRF). 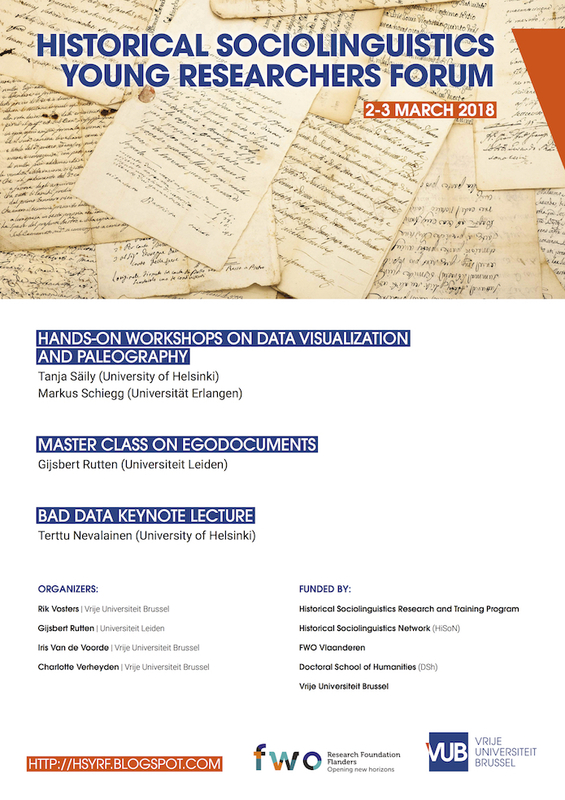 This new yearly event is aimed at early career researchers – MA and PhD students, postdocs, and other young (at heart) researchers –, offering a mix of lectures, classes and hands-on workshops on various topics relevant to anyone interested in historical sociolinguistics or language history more generally. The first edition of the event will take place on 2-3 March 2018 at the Vrije Universiteit Brussel (Brussels, Belgium).